According to a new market research report published by Transparency Market Research titled “Screw Piles Market - Global Industry Analysis, Size, Share, Growth, Trends, and Forecast, 2019 - 2027” the screw piles market across the globe is anticipated to reach US$ 1,365.4 Mn by 2027. The market is expected to expand at a CAGR of 5.0% for the period 2019-2027. The growing demand for construction foundation is seen as a key driver of the screw piles market across the globe. The global screw piles market has been segmented on the basis of type into SS-RS combinations type screw piles, SS (Square Shaft) type screw piles, RS (Round Shaft) type screw piles, and helical grouted displacement piles (HGD Piles). Based on application, the screw piles market is segmented into Utility, Railways, Roadway, Bridges, & Walkway (RRBW), agriculture, construction, marine, commercial construction, and others. The RS (Round Shaft) type screw piles segment held major volume share in 2017. The screw piles market based on distribution channel is segmented into online channel and offline channel. Increase in commercial construction and government infrastructure are projected to offer significant growth opportunities to the screw piles market in the coming years. End-users opting for low carbon footprint may also boost the demand for screw piles in the coming years which is also driving the market. Growing demand for customized galvanized stainless steel across deep foundation construction are also anticipated to deliver growth prospects for screw piles. In the current scenario, the global screw piles market is highly fragmented. However, there are a few well established players having strong distribution network and providing integrated and advanced solutions across different industries. The companies are strengthening their position through merger & acquisition and continuously investing in research and development (R&D) activities to come up with solutions to cater to the customers’ requirements. North America is the largest region in the screw piles market. The North America screw piles market for RS (Round Shaft) type screw piles is expected to expand at a CAGR of 5.1% in terms of revenue. Demand for RS (Round Shaft) type screw piles in North America is likely to grow rapidly in the U.S. and Canada due to presence of a large civil construction sector in the region. According to the report, the Asia Pacific screw piles market is expected to expand at a CAGR of 5.0% in terms of revenue. 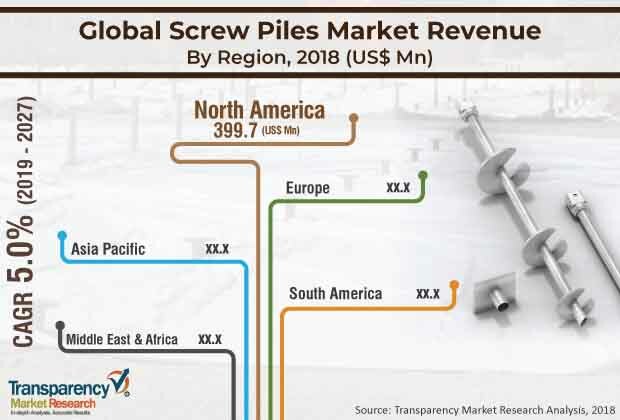 The markets in South America and Middle East & Africa are expected to expand at a CAGR of 4.7% and 4.5% respectively in the screw piles market. The market in Europe is expected to grow at a gradual rate at a CAGR of 4.8% in terms of revenue. Leading global players are focusing on product innovation and collaboration to expand their business. Major screw piles market players profiled in the report are Almita Piling Inc., Hubbell Incorporated, TorcSill Foundations LLC, Earth Contact Products, GoliathTech Corporation, Pier Tech Systems LLC, Supportworks, Inc., and Magnum Piering Inc. This market is highly fragmented as large number of mergers and acquisitions are expected. Rivalry among existing players in the market is medium as adequate numbers of players are engaged in acquiring smaller players to gain market share.